Are Manufacturers Ready for the Connected Industrial Workforce? Despite plans to invest in machines and artificial intelligence as part of their strategy to boost productivity, many automotive and industrial equipment companies are failing to implement the measures needed to harness these capabilities, according to a new report from Accenture. The report, “Machine dreams: Making the Most of the Connected Industrial Workforce,” is based on interviews with more than 500 business executives in Asia, Europe and the United States involved in setting their company’s strategy for the connected industrial workforce. According to the report, manufacturing and production are undergoing rapid change as machines and AI are becoming closely integrated with personnel, creating the connected industrial workforce. By combining mobile, safety and tracking technologies with analytics, companies are enhancing the activities of an industrial worker. 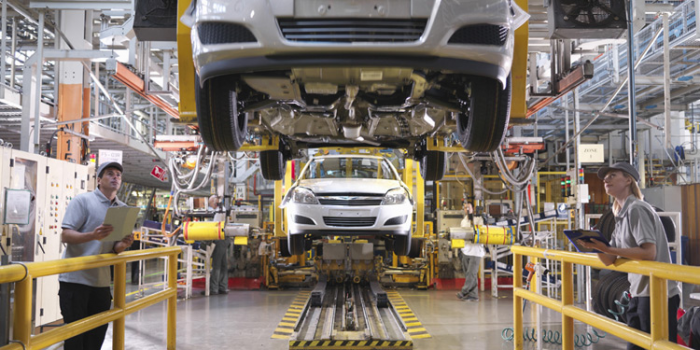 The report concludes that the creation of a connected industrial workforce is already part of the business strategy of the majority of automotive and industrial equipment producers, cited by 94 percent of respondents. Respondents estimate that their companies could spend up to one-quarter of their R&D expenditure over the next five years on connected industrial workforce technologies. This could reach €181 billion for automotive companies and €39 billion for industrial equipment companies. But while the manufacturing companies surveyed believe that the impact of the connected industrial workforce will be significant, the research reveals that the companies making these investments could fail to maximize the competitive advantage that the investments can bring. For instance, fewer than one-quarter (22 percent) of respondents said their companies have implemented measures designed to realize the potential of a connected industrial workforce, with 85 percent of respondents describing their companies as digital followers or laggards, rather than leaders. One of the issues that could adversely impact the implementation of a connected industrial workforce is the related technology. Data vulnerability is seen as a medium or high risk for 76 percent of respondents, while system complexity and related vulnerability is seen as medium or high risk by 72 percent of respondents. In addition, more than two thirds (70 percent) of respondents consider a shortage of skilled human workers to be a high or medium risk. This could also impact their ability to deliver on their connected industrial workforce strategy. The vast majority of respondents – 85 percent – said they expect the focus of technology in manufacturing to evolve from human to human-machine-centric, where collaborative machines, humans augmenting machines and autonomous machines are combined to create a more effective workforce. A number of the organizations surveyed have a clear focus for investments relating to workforce effectiveness. Autonomous guided vehicles – mobile robots that move materials around a facility or warehouse – already account for half of spending by these companies in this area and will continue to account for much of it in the future. The same organizations plan to boost their investments in both collaborative robots (“cobots”) and augmented reality devices, including smart glasses and helmets, over the next five years. In their efforts to tackle the security concerns, a number of respondents are also investing heavily in upgrading their existing IT infrastructures to help ensure a securely connected workforce. Among the respondents who believe they are leading the creation of the connected industrial worker, 89 percent have started to hire new talent to close the skills gap. Accenture estimates that by 2020 the connected industrial workforce could help an automotive manufacturer with annual revenues of €50 billion unlock as much as €500 million in additional profitability – including €50 million in increased R&D profitability, €415 million in increased profitability from manufacturing and supply, and €30 million in increased after-sales profits. Among the respondents who are seeking to use technology to help them improve productivity, the automotive manufacturers and suppliers have the highest interest in collaborative robots, automated guided vehicles and augmented reality devices. “As cobots take on more and more specialized tasks, leading manufacturers that are investing in digital to harness competitive advantage are moving rapidly toward human-machine-centric manufacturing,” added Schaeffer. The report also identified some differences by country in terms of their R&D investments in connected workforce technologies. U.S. respondents expect to make the highest percentage of R&D investment in the connected industrial workforce, at 40 percent of total R&D spend. The next highest percentage is for respondents in China, estimating 23 percent of R&D to be spent in this area, falling to 17 percent of total R&D spend for respondents in Japan. The respondents in Germany and France estimate 20 percent and 19 percent respectively.